At Zimmerman Realty Ltd., we strive for excellence in the real estate services we provide to our clients. This site is the next step in our dedication to providing exceptional service to home buyers interested in Logan County real estate. We invite you to explore this website, the different communities that we cover, and all the properties available in this gorgeous corner of the country. Logan County's population of more than 45,000 can attest to the majestic beauty and wonderfully tight-knit communities that exist in this county. Small communities such as West Liberty are steeped in rich history with landmarks such as the enigmatic Piatt Castles. The Logan County History Center and Logan County Transportation Museum reveal a deep connection to a varied and storied past and are positioned near the historic downtown area of Bellefontaine. Logan County real estate also features an easy proximity to a wonderful array of outdoor attractions: The Mad River Mountain, just minutes from Zanesfield, boasts the best skiing in the state with manicured runs that always feature fresh powder throughout the winter. The fascinating Ohio Caverns near West Liberty and the expansive and sparkling Indian Lake round out Logan County's stellar natural attractions. Without a doubt, one of the most popular attractions within this area of the state is the picturesque Indian Lake. The lake features over 30 miles of shoreline and a series of islands within the lake have come to be collectively known as the "Indian Isles" and encompasses some of the most sought-after Logan County homes for sale. The surrounding banks of this stunning lake have also attracted a number of thriving communities including Lakeview, Huntsville and Russells Point. The name of the lake comes from its origins as a traditional center for fishing by area Indian groups, back when it was a series of smaller lakes amid a fertile wetland. 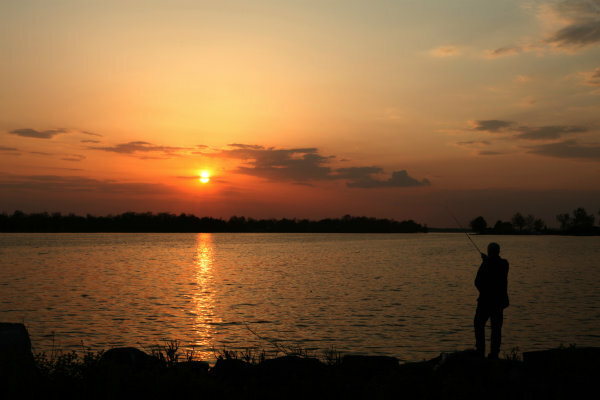 Today, the lake is a popular boating and fishing location with numerous fishing tournaments held each year. The lake is stocked with fish including Saugeye; you're bound to snag a few of the bass, bluegill and crappies that call the lake home. Welcome to ZimmermanRealty.com: Your Source for Homes for Sale in Logan County! We've created ZimmermanRealty.com to be your guide through the homes for sale in Logan County and the many thriving surrounding communities of Ohio. Search for your ideal home using our advanced search that allows you to save your searches and set up e-mail notifications, so you can be notified as your dream home becomes available on the market. Also, keep up to date with all the happenings in Logan County and Indian Lake with our blog. We've also put together a number of resources for the buying and selling of Logan County real estate, to make the entire process as easy and stress-free as possible. Zimmerman Realty Ltd. has grown to become the industry leader in the greater Logan County area. We have two offices in the county seat of Bellefontaine and Huntsville, near Indian Lake, to serve our customers better. Whether you are moving across the street or across the county, Zimmerman Realty is here to help make the process as quick and easy as possible. Please don't hesitate to contact us online, or give us a call at 937-592-4896 or 937-843-9400, if you have any questions about the homes for sale in Logan County, Indian Lake or the many fantastic surrounding areas. We also invite you to get to know your real estate agents a little better, here.